The Wall Street Journal reported today that Microsoft was in discussions to buy Nokia's handset business but talks broke down over the valuation. This development could help explain Nokia's strategic mis-steps over the last few years. Microsoft Corp. recently held advanced talks with Nokia Corp. about buying its handset business, people familiar with the matter said, as laggards in the fast-moving mobile market struggle to gain ground. The discussions faltered over price and worries about Nokia's slumping market position, among other issues, these people said. One of the people said talks took place as recently as this month but aren't likely to be revived. I have previously analyzed Nokia's strategic failures, but I was very surprised by the unwavering support Stephen Elop received from Nokia's board. If the ultimate goal of Nokia's leadership team was to sell the handset business (not just the smartphone business) to Microsoft (and no one else), then their strategy did make some sense. Let's take a look at their high-end & low-end strategies and how their choices may have helped Nokia look more attractive to Microsoft. When Stephen Elop made the announcement picking Windows Phone as Nokia's exclusive smartphone platform, the decision was widely (and rightfully) criticized. This move bet the future of the largest handset manufacturer in the world on a smartphone platform that had a market share in the low single digits. Even after Nokia's Lumia devices struggled to gain mainstream acceptance and shareholders revolted, Nokia's leadership refused to change course. This only makes sense if Nokia decided, at some point, that an outright sale to Microsoft was the best possible option to maximize shareholder value. While Android-based smartphones could have helped spur sales, the business would be worthless from Microsoft's perspective. If an acquisition were to take place, Microsoft would immediately shut down the Android business and therefore, the revenue from those devices would have never been accounted for in the valuation offered. Nokia's low-end strategy was even more puzzling than its high-end strategy. While OEMs were building a portfolio of low-end smartphones, Nokia was attempting to combat them with the Asha portfolio, i.e. feature phones. While Windows Phone exclusivity ruled out using Android for this segment, Nokia even cancelled in-house development of low-end smartphone platforms. While this was a terrible strategy for market success, it may have helped cement Nokia's commitment to Microsoft. Since no third-party operating systems were being used or developed, Microsoft would not need to "kill off" any current or potential revenue stream after an acquisition. But if this was the case, why was Microsoft mulling an acquisition of the entire handset business in the first place? 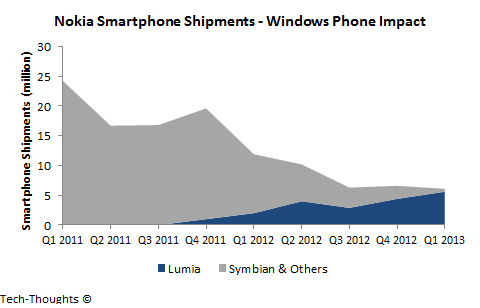 It would certainly make far more sense for Microsoft to acquire just the smartphone division. My guess is that Nokia's board refused to part with just the smartphone division. If the smartphone division were to be sold, Nokia would be left with a badly mismanaged feature phone business in a rapidly shrinking market with no potential buyers. Was This a "Good" Strategy? After putting all their eggs in Microsoft's Windows Phone basket, Nokia's "Plan-B" seemed to involve putting all their eggs in the Microsoft acquisition basket. Now that Microsoft has reportedly walked away, Nokia finds itself in an unenviable position. Even though they may draw acquisition interest from other companies, the company's strategy has ensured that the valuation offered will be even lower than the one from Microsoft. If Nokia's financials don't show marked improvement over the next few quarters, Nokia's board may have to answer some difficult questions.